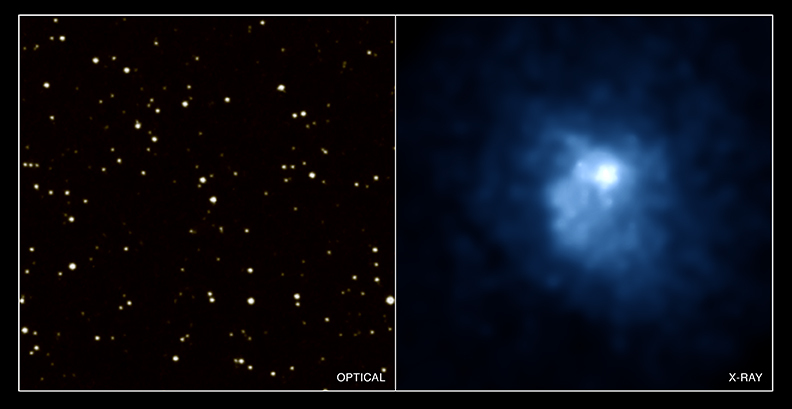 In this side-by-side comparison, an apparently ordinary star field in optical light (left) is shown to be dramatically different when observed in X-rays (right). Chandra's image of 3C438, the central galaxy within a massive cluster, reveals evidence for one of the most energetic events in the local Universe. An arc-like feature to the lower left in the cluster's hot gas is about 2 million light years long. Astronomers have determined that an enormous amount of energy would be required to produce such a large structure. One plausible scenario is that two massive clusters collided at high velocity and later merged. This would have created a shock front in the hot gas that could account for the ridge seen in the Chandra data. 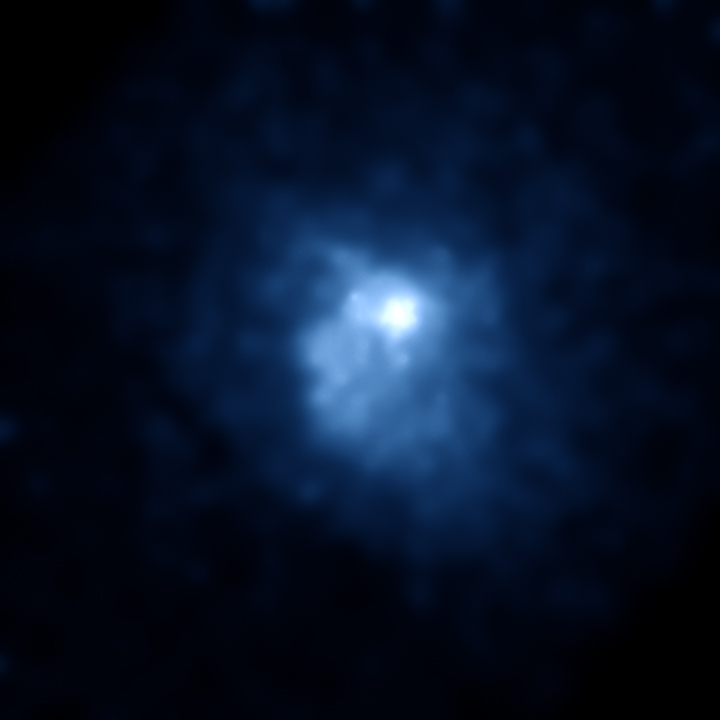 Another intriguing feature in the Chandra data is the possible detection of a cavity in the hot gas. This structure, seen in the upper left of the image, would require a tremendous amount of energy to produce. There are also hints of a similar structure on the other side of the central galaxy. Astronomers think such X-ray cavities are usually generated when large amounts of matter funnel into a supermassive black hole. The black hole inhales much of the matter but expels some of it outward in a high-speed jet, carving space into the hot gas. If the cavity was generated by a supermassive black hole, then it would be the most powerful event of its kind ever seen. Coordinates (J2000) RA 21h 55m 52.30s | Dec +38º 00' 29.60"